“On The Road”…again, in search of a ghost. Of all the marshes, in all the refuges, in the entire world, it flew into mine. Well not exactly mine, rather the Federal Government’s refuge. However this particular refuge is Muscatatuck National Wildlife Refuge, a relatively short 2 hour drive due west from Cincinnati near the lovely town of Seymour Indiana. I and Jon are on a mission, a new life bird for me mission. It’s 3 am Saturday morning, and I’ve been tossing and turning for the last 45 minutes just thinking about our trip today. I finally give in and walk into the kitchen and fire up the coffee maker, a vital resource for these early morning trips. While the urn fills with the wake-up juice I shower and dress for yet another rainy day. At 4 am after a quick breakfast and the gear stored away in the bird-mobile, I’m off to the gas station for a quick splash and dash. At 4:30 am I arrive at Jon’s house. He was planning on doing the driving today but when i suggested we leave at 4:30 I included the offer to drive to make up for the sleep deprivation Jon was going to experience. I really wanted to get to Muscatatuck as early as possible. My original plan if Jon wasn’t going was to leave the house at 3:30 am. I don’t want to dip on this bird. This bird is a big deal, in a little package. You see it all started a week ago last Sunday after I got home from my trip to Lake Erie. It was in the evening when Jon texted me and asked if I had checked the Indiana Listserv. It turns out a local Cincinnati birder (who, by the way is a very good birder) heard a Black Rail at Endicott Marsh, which is located inside Muscatatuck NWR. A BLACK RAIL! One of the most elusive birds in all of North America, is just 2 hours from my house. And despite just being 2 hours away, it seemed to take forever to get there once we pulled away from Jon’s house. We pulled through the refuge gate at 6:30ish and headed back to Endicott Marsh. During the week building up to this morning I’ve been on Indiana’s Listserv checking multiple times each day waiting for verification that the bird was still there. And each day someone reported that it was, calling from different locations in the marsh. A confirmation on Friday sealed the deal to make the trip early Saturday morning. We were the first to arrive. The crunch of the gravel under the tires and the Red-winged Blackbirds was the only sound heard as I rummaged in the back seat getting my harness on and attaching my bins and camera. Jon heard the bird first, as usual. It wasn’t the typical “ke-ke-kerr” call we normally associate the Black Rail to. After adjusting my hearing to other sounds other than Red-winged Blackbirds and Sedge Wrens, I heard the bird. This time it was the “ik-ik-ik” call, further out and easily overlooked if you weren’t really listening closely. Endicott Marsh. From the tree line to the gravel road, to just about where I’m standing is all there is of this marsh. Not very large but home to a Black Rail. For the next couple of hours we birded around the area, always listening for the Black Rail, hoping it would move closer. Eventually it changed it’s call to the more familiar “ke-ke-kerr”, which gave me a bit of satisfaction knowing beyond a shadow of doubt the bird was there. Tick off another lifer. As the year closes, I feel that a reflective post is in order. Review what has transpired from a birding prospective over the course of the year 2010. If I had to sum up 2010 in one word, it would be “Incredible”. The minute I made the decision to devote more of my spare time to birding, it has been a thrilling ride. The triggering mechanism that hurtled me to birding bliss was the purchase of my spotting scope. As I’ve said in the past, if it wasn’t for my spotting scope my “Life List” wouldn’t be what it is today. And when you can pull in that far away duck, and be able to identify it, that’s what keeps me coming back. Following Cincinnati Bird Club’s web site, and religiously checking the postings of recent sightings has been invaluable. On a number of occasions I’ve followed up on a sighting that was posted, and I come away with a new bird for my life list. Case in point, the American Avocets at Cowen Lake State Park. Discovering new places to visit has taken me to hot spots I normally wouldn’t go to. Just in the Tri-State area I’ve visited Boone County Cliffs, Shawnee Lookout Park, Winton Woods, Sharon Woods, Armleder Park, The Oxbow, Miami Whitewater Forest, Fernald Preserve, Halls Creek Preserve, Voice of America Park, Ft. Ancient State Memorial, Brookville Lake State Park, Cowan Lake State Park, Caesar Creek State Park, Magrish Riverland Preserve, and Spring Valley Wildlife Area. Some of my birding adventures have taken me on the road. I really enjoy traveling and hope to do more in 2011. Distant birding venues include Red River Gorge, Mackinac Island, Magee Marsh, Ottawa and Muscatatuck National Wildlife Refuges. Some of my more recent trips have taken me to Lake Erie, Killdeer Plains and Mercer Wildlife Areas. I’m meeting new friends as I participate more and more in organized field trips. Whether they are sponsored by the Audubon Society, or Cincinnati Bird Club, joining a group, I feel, makes you a better birder. They all have pearls they want to share with an experienced novice like myself. I really enjoy field trips with knowledgeable and passionate birders. Either with a large group or my best friend Phil. With the addition of “A Birder’s Notebook”, I’m able to share my thoughts and experiences to the public. This blog has taken my birding encounters just one step toward “Birding Happiness”. That may sound corny, but it’s true. To be able to share your thoughts and exploits with other people helps me to maintain my focus. To help educate birders and non-birders, whether it’s about “Birding Ethics”, to book reviews, I enjoy keeping my blog updated with the latest information. Now onto my list of new birds I’ve seen this year. Now you may look at this list and say to yourself, “what a long list”. Just remember this is the first year that I put forth the effort to bird on a regular basis. Traveling to Magee Marsh in the Spring added to my life list quite a bit. My spotting scope has helped a little bit as well. So what’s in-store for me in 2011? Well, I’ll be picking up where I left off in 2010. Maintaining a consistent routine where I attempt to get out at least once a week. Keeping an eye on Ohio Listserv and Cincinnati Bird Club sightings log, to keep myself ahead of the game. Participating in more organized field trips, that will in turn build upon existing friendships,and hopefully produce more. Adding to my life list towards 300 different species. Also this year I’m adding a new spotting scope to my birding tools. Why would I do such a thing when my present scope is only a year old? Well, I had issues with the eyepiece and cold weather. It wasn’t a very expensive spotting scope in the first place, and now would be a good time to up-grade. More on this as the purchase date draws near. Phil and myself are presenting our 3rd annual Bird Study Merit Badge. The date has been set and the location has changed to Fernald preserve. I’m very excited about this years class. I love Fernald Preserve, and I’m sure the scouts will to. And finally, I’ll be studying harder so I can improve upon my existing experience to be a better birder. See you in 2011. With a travel mug full of coffee, and a greasy sack of delectable goodness from McDonalds, I’m “On The Road” to Muscatatuck National Wildlife Refuge. My first stop though is Lawrenceburg Indiana to meet up with some of the other birders going along. As we head out of Lawrenceburg on this chilly October morning, the sun starts to rise in the East with the promise of a beautiful morning. This trip, being the second “On The Road” installments is a return to a place where I was only at briefly. The 1st time I had visited Muscatatuck was in March of this year, during my older sons spring break from college. March wasn’t particularly a good month to be there, even though I spotted a couple new birds when I was there. I was hoping for the same luck this trip. At about 102 miles and taking a little over 2 hours it was a pleasant enough drive. Being this close I’m kind of ashamed that I don’t come here more than I have. This will change. I think an annual spring and fall trip would be a good thing. We arrived at the visitors center and made a pit stop, and checked out the gift shop and the viewing room. At 7,724 acres of mixed forest, wetlands, and grasslands, this place is massive. With over 280 species of birds reported, I’m ready. We cross the road and start with a short walk on a mowed path with good cover. Further down the trail we approach a small pond with the hopes of wading birds. No luck. 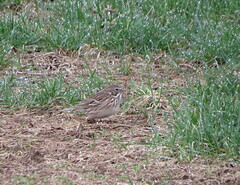 This area did produce a fair amount of different species of Sparrows and a few Warblers. We were here for about an hour. And with a lot of ground to cover it was back to the vehicles. Now it was off the asphalt and onto the gravel with all the dust. We started our drive towards an area called Meyers Cabin. And it just so happens that a cabin festival was going on at the same time. However, before we arrived at the cabin we had stopped several times to do a little birding. And a good thing to, because as we turned a corner we pulled up to a couple who were watching Red-headed Woodpeckers. There must had been 6 of them going back and forth over the road taking acorns to their holes and storing them. I haven’t seen this many Red-headed Woodpeckers since we were at Gettysburg. We watched for several minutes before motoring on. We hadn’t gone very far when the lead car pulled over and people started getting out. They all were looking sky ward and I soon found out why. There wasn’t a whole lot of water birds, but we did happen to spot the Pied -bill Grebe alone in this pond. I should have gotten out of the truck to take this picture. Well, the reason we were heading towards the cabin was because they had opened up a section that’s usually closed to the public. We were there on the last day for this week long public access. We were anticipating wetlands and wading birds as we started along this long road. What we found at the end was a dried up wetlands. This was very sad. With fall migration in full swing, not being able to view any water fowl. This place should be busy. The drought has really played havoc at Muscatatuck this year. And there’s no relief in sight. This field should be covered in water. After this long hike we returned to the cars to head off to our last stop for the day. The trip leader suggested a small marsh area with a viewing platform that over looked a small pond. 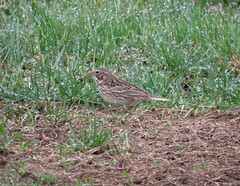 This area produced some good Sparrows and Bluebirds. 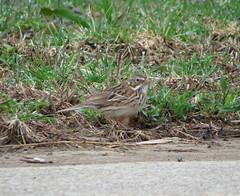 We were on the look out for some Nelson’s Sparrow that had been seen here a few weeks earlier. Overall we had a good day, with beautiful weather. Who could ask for anything more. A new bird would had been sweet. Oh well, maybe next time. Muscatatuck was a wonderful place to spend the day, even if you don’t bird. It’s a nice day trip that won’t wear you out once the day is over. I can’t wait to go back in the spring. So I leave you know with the days bird list.